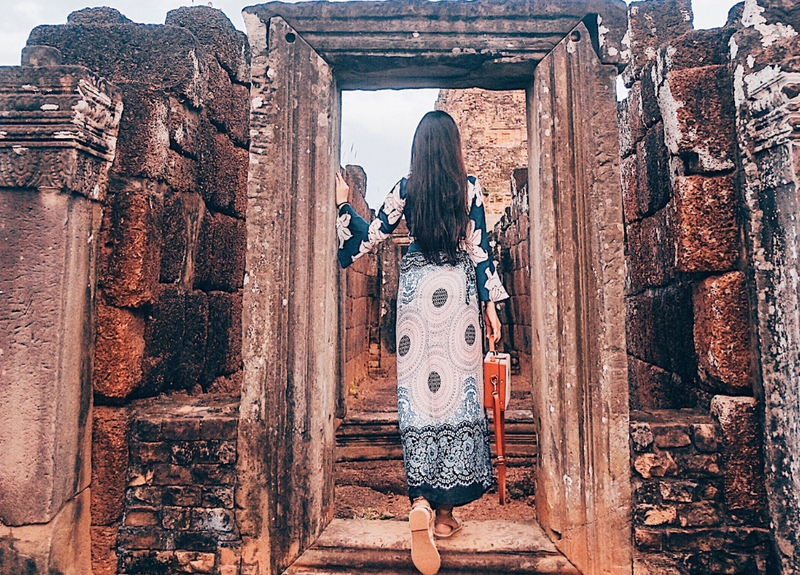 Travelled to #Cambodia with my girl in 2018. Finally ticked Cambodia off my bucket list! I have been always wanting to visit this country since I was a kid but never have a chance. Mostly because none of my friends finds it interesting (not a shopping paradise, they don’t want) As I always say, a suitable travel partner is hard to find but thank god we made it! 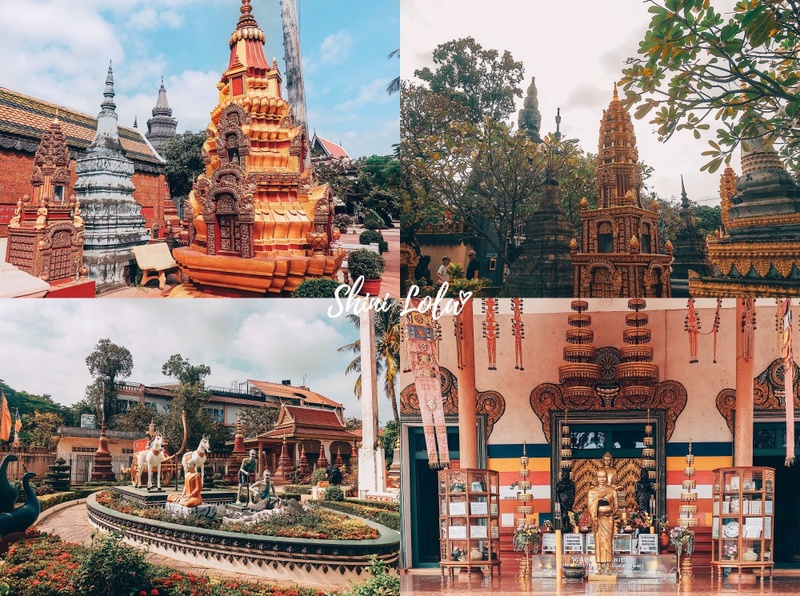 For the first day, we had visited Siem Reap River, Wat Pre Prom Rath Pagoda, Preah Ang Chek Preah Ang Chom Temple, Pre Rup Made In Cambodia Market and Siem Reap Art Center Night Market. 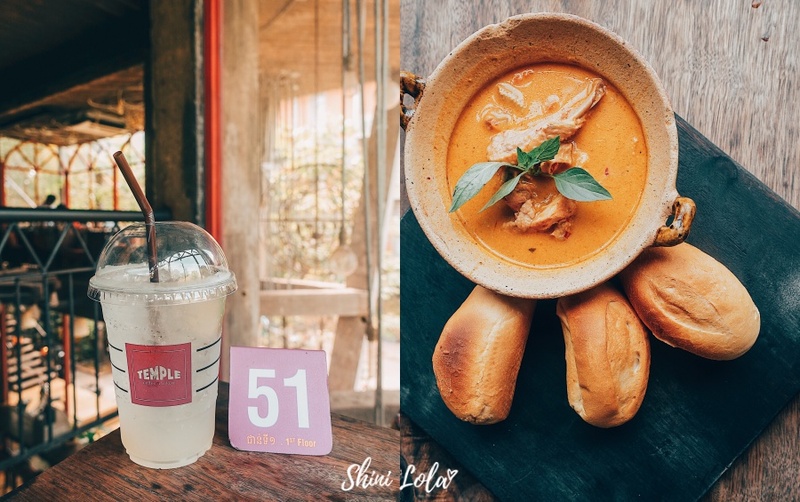 For more photos, kindly search #ShiniInCAMBODIA on Instagram. I LOST MY PHONE ON THE PLANE. Sometimes, I can be a very CARELESS person. But never in my life, I had ever lost my phone on the plane. I have no idea why I did this time. Probably I'm too excited to visit this country. Everything was okay when we landed at the Siem Reap International Airport. Right after I passed the immigration and while waiting for my friend, I thought I can take out my phone to check the wifi connection. All of sudden, I CAN'T FIND MY PHONE IN MY BAG! Greats, what should I do now. I'm super nervous because it was my first time to lose my phone at oversea. I quickly approach one of the security guards and he brought me to the "lost and found" counter. He helped me explain the situation to the girl at the counter and asked me to wait. After about half an hour, AirAsia staff found my phone, it was inside the pocket of the seat. Oh my god, why I'm so careless. I was told to wait at the AirAsia office to collect my phone. After some verification, finally, I got my phone back. Thank god it didn't go missing because that time the plane was about to take off. I totally feel guilty for the passengers onboard, the driver who is waiting for me and my friend as well. Feel so thankful that the airport staff, security guards and AirAsia team for helping me to find my phone. Kudos to all of them! Lunch : Temple Coffee n Bakery. After check-in our hotel, we had our brunch at Temple Coffee n Bakery. It is located along the Siem Reap river as a best and largest coffee shop in Siem Reap, with it’s an excellence hot & cold coffee selection for takeaways to Angkor Wat or sit down and relax with a comfortable furniture in the best architecture and designed in Cambodian, Temple bakery also serves a freshness of homemade ice cream, bakery, pastry, cookies, birthday cake. We had ordered 2 sets of American Breakfast which cost us about 10 USD. Yes, everything in Camdoai sells in US Dollar so this meal was about RM40+. It served with a croissant, egg benedict, sausage, grilled cherry tomato, baked bean, fruits and yoghurt cream. For the drink, I had ordered a lemon juice. I love the fact that it doesn't consist any sugar and tastes sour. This is what I want for a lemon juice instead of sweet syrup. One of my friends had ordered the curry chicken with bread. It smells and tastes so good. For your info, Cambodia's curry is more into sweet taste though. They open daily from 6am to late night, consisting their Temple Bakery rooftop also having Sky Lounge for you to enjoy excellence cocktail and live Filipino Band is open daily from 6pm to 2am. Address : Street 25, Archbishop Mondulkov 17253, Cambodia. After finished our brunch. We decided to take a walk. 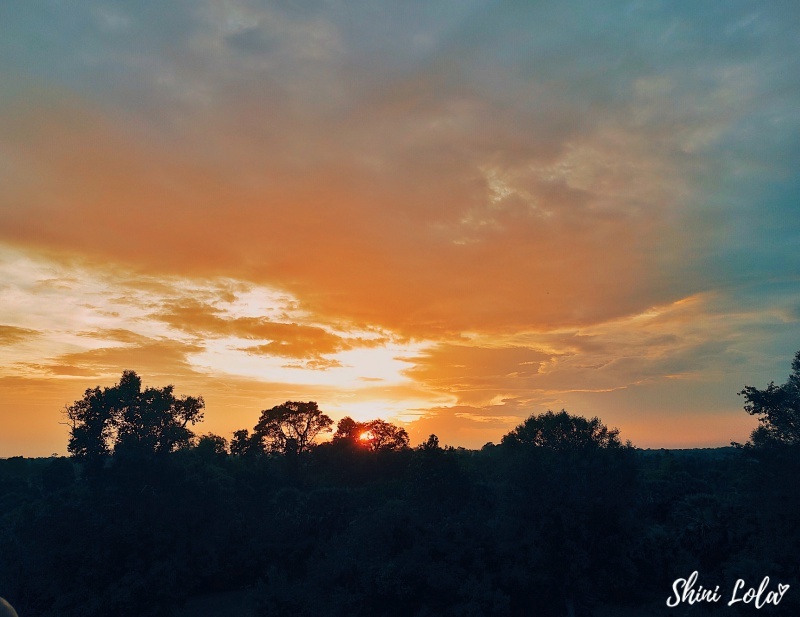 The Siem Reap River parkways and the big park in front of the Hotel Grand d'Angkor are nice for a jog, stroll and people watching, especially in the early evening hours when the locals are out in numbers. The river area is pleasant and the park is nicely landscaped. There are plenty of drink and snack vendors around. The king's Siem Reap residence is just across from the park. Wat Pre Prom Rath Pagoda. Wat Preah Prom Rath is one of the most beautiful pagodas in Siem Reap. It is located on the riverside, near the Old Market (Psar Chas). The monastery has many fine and colourful wall paintings and you will find many modern statues inside. Often, you will see monks in the early morning or late afternoon. They follow Buddhism courses and English classes in this pagoda. 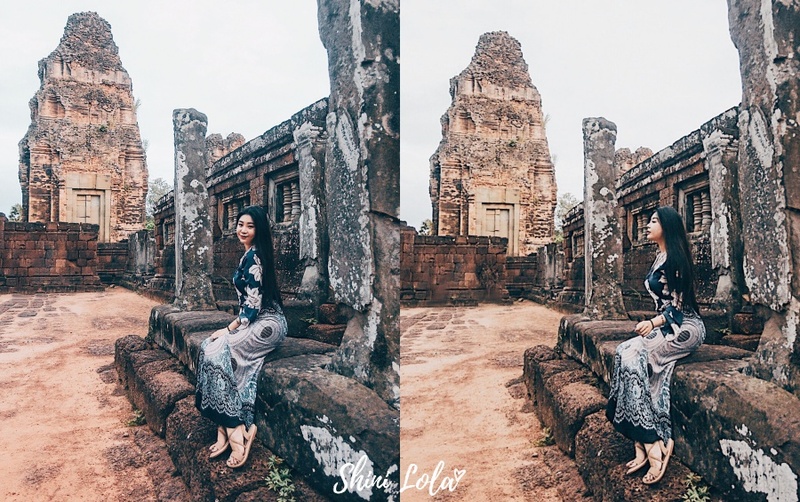 It is not clear exactly when the pagoda was built, however, its claim to fame is the great reclining Buddha that was installed in the main temple (Preah Vihear) in 1500. There is a picturesque fable about why the Buddha is there, so if you want to find out how a boat turns into a Buddha, go and take a look. In 1915, the temple and main monastery were extended, to include an academic building (University) and a library. The expansion continued until 1945. Preah Ang Chek Preah Ang Chom Temple. 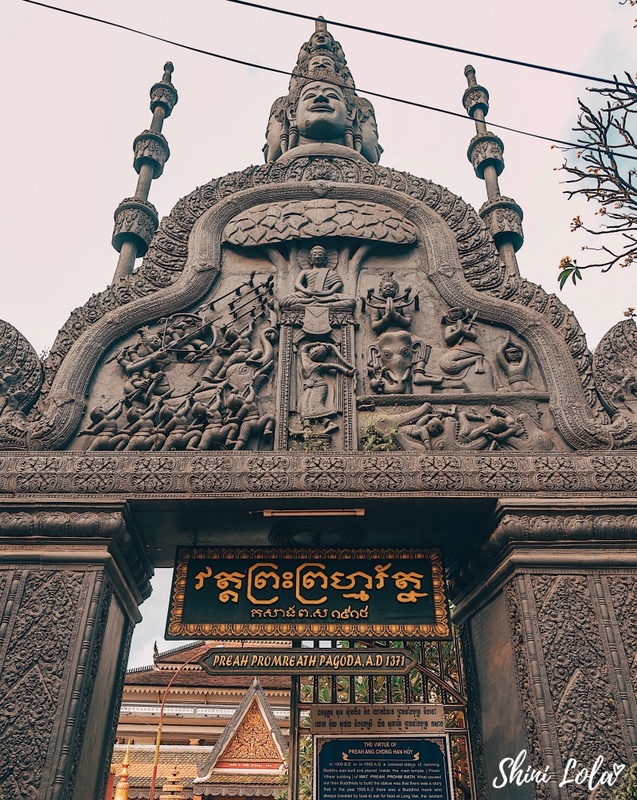 Located just west of the royal residence is the shrine of Preah Ang Chek Preah Ang Chorm. Said to represent two Angkorian princesses, these sacred statues were originally housed at the Preah Poan gallery in Angkor Wat but were moved all over Siem Reap for their protection from invaders, eventually settling here in 1990. Locals throng here to pray for luck, especially newlyweds, and it is an atmospheric place to visit around dusk, as the incense smoke swirls around. We are lucky enough to spot a pair of newlyweds were there to pray for their love. Their traditional wedding costumes were so beautiful and elegant. Quite similar to Thais. 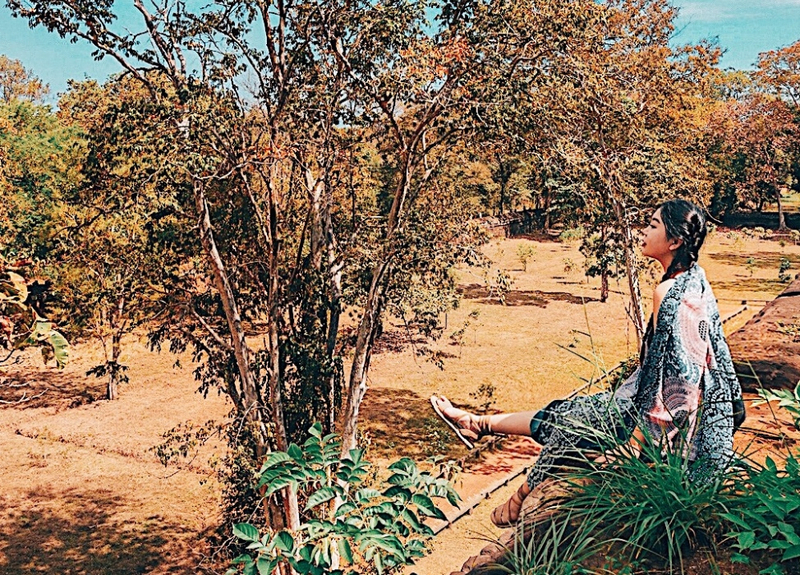 Next to the shrine are the tall trees of the Royal Gardens, home to a resident colony of fruit bats (also known as flying foxes) that take off to feed on insects around dusk. Every scream for ice cream! After walking for couples of km. We decided to stop by at Fifty5 Kitchen & Bar for ice cream before going back to our hotel. 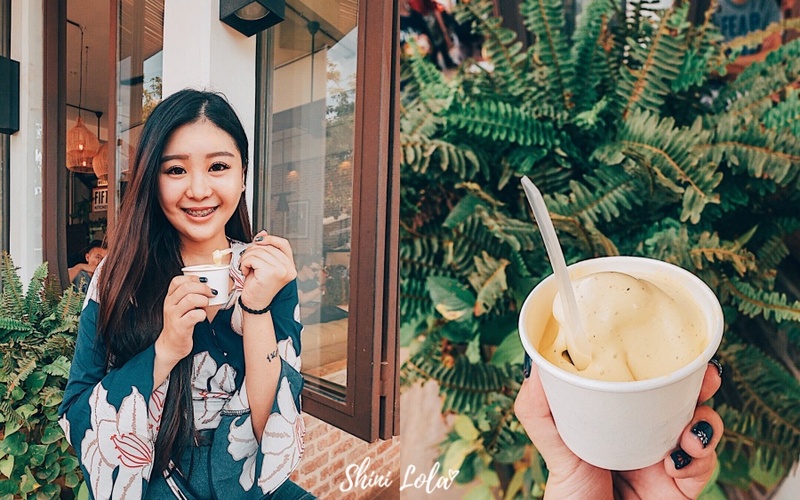 Actually, they are not just served ice cream, they have varieties of foods but we just aim for ice cream because we were full. It is just located nearby our hotel (walking distance). Address : Corner 2 Thnou St and Street 09 Mondol1Village, Svaydongkom Commune, 17252, Cambodia. 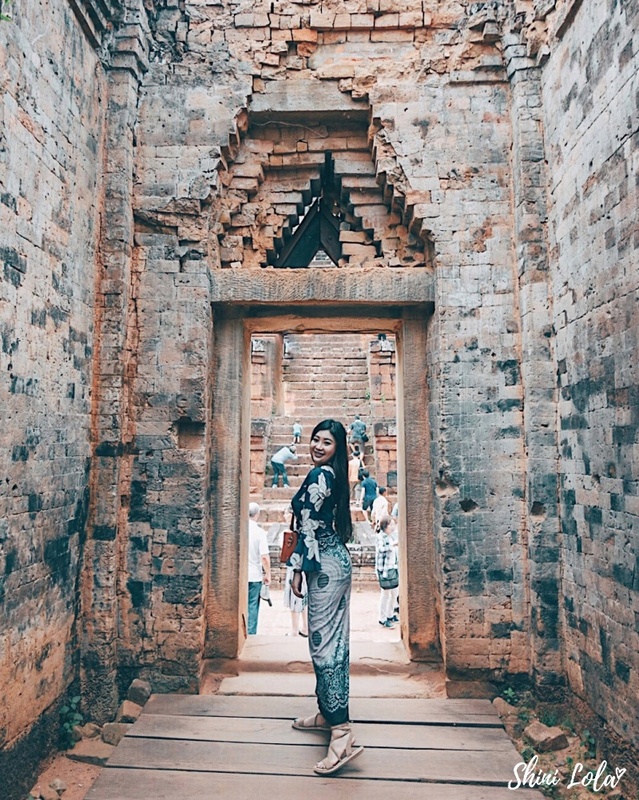 Unless you are Cambodian, you must possess an admission pass, often called Angkor Pass, to visit the temples in the Angkor Archaeological Park. The Angkor Pass is also valid for some other monuments in the Siem Reap area, like Phnom Krom, Wat Athvea and the Roluos Group. 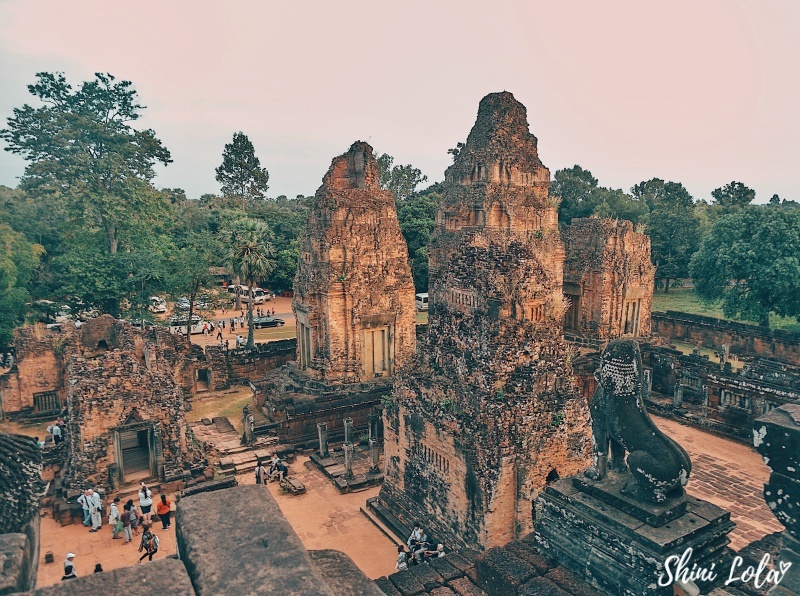 The Angkor Pass can only be purchased at the official ticket centre, located 4km away from Siem Reap town and open from 5am to 5.30pm every day. Tickets purchased from hotels, tour companies and other third parties are not valid. You can either paid in cash (US Dollars, Cambodian Riel, Thai Baht or Euro) or by credit card. An on-site ATM is available to withdraw cash. You can't purchase the entrance ticket upfront. Entrance tickets for a one-day visit are issued up to 5pm, tickets issued after 5pm are valid for the next day. Consult the business directory for more information and the exact location of the Angkor Ticket Office. When you book a taxi or tuk-tuk driver for the day, he will bring you to the ticket office before entering the park. Pre Rup is a Hindu temple in Angkor, Cambodia, built as the state temple of King Khmer Rajendravarman and dedicated in 961 or beginning 962. It is a temple mountain of combined construction of bricks, laterites and sandstones. The temple's name is a comparatively modern one meaning "turn the body". This reflects the common belief among Cambodians that funerals were conducted at the temple, with the ashes of the body being ritually rotated in different directions as the service progressed. There is only the first day, but I had already felt my feet are hurt. If you check out the previous photo, you should spot the staircase right behind my back. There are so many steps for visiting each temple. I'm wondering how the elderly gonna climb these staircases? Even young adult like me is tired like hell when I'm climbing those stairs. We climbed all the way to the top just to catch the sunset here. However, this sunset doesn't impress me. To me, it more like a normal sunset. I'm looking forward to another sunrise/ sunset for this trip because my friend like to watch them. 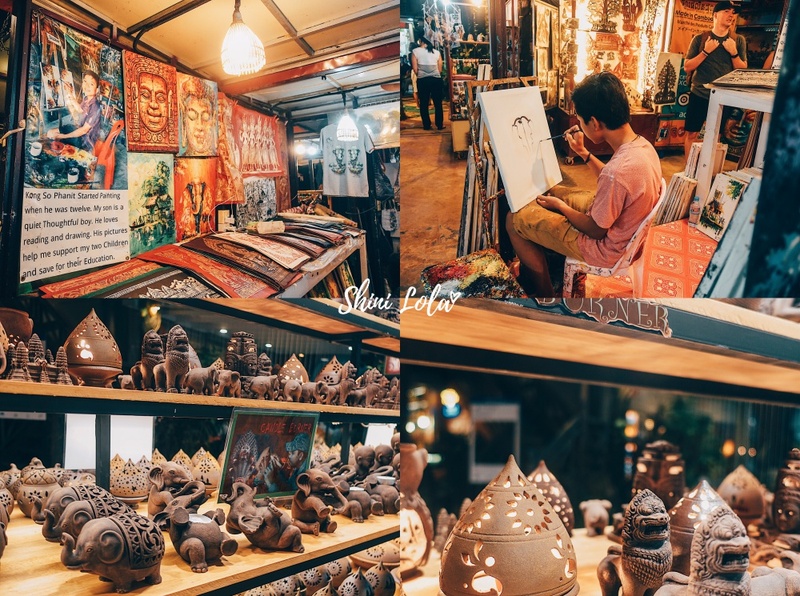 Aside from the colourful, original array of food, art, clothing, homewares, cosmetics, toys, jewellery and more, its chief defining characteristic is, as the name suggests, that everything sold here is made in Cambodia. This is in stark contrast to every other market in town, where the majority of the wares sold are generic junk made in China, Vietnam or Thailand. However, the price range is slightly more expensive here. Thus, if you plan to buy souvenirs, I don't suggest you buy here. Maybe you can try to bargain but I think they set the price range quite high here, makes your harder to get a good price. We just stopped by to have a walk, we didn't buy anything here. Address : Street 27, Achar Sva St, Krong Siem Reap, Cambodia. Dinner : Siem Reap Art Center Night Market. Siem Reap Art Center Night Market is located on the east bank of the Siem Reap River, right opposite the Old Market (Phsar Chas). Since its opening in 2012, this market offers a broad mix of locally manufactured products like silk, handicrafts, crocodile leather, clothing and many other souvenirs. The market also has a couple of restaurants on-site which offer a fine combination of Khmer and Western food. Free wifi is available and payments by credit card are possible. You can also enjoy a free Apsara dance show performed every day from 20.00 till 21.00. When you come from the Old Market, just cross one of the two walking bridges over the river and you’ll find yourself at the entrance of the market. It's dinner time! My friend wants to dine at the night market because she said those food are affordable. Each of this cost about 1 USD only. However, I do question on the hygiene though because our driver told us it's not safe to eat that street food because they are not clean. Therefore, this is the only time that I ate street food in Cambodia. I rather pay more to dine in the restaurant, at least the food is cleaner. There are so many stalls nearby selling souvenirs, clothes, accessories and so on. You guys may want to check them out. Since we were so tired and we need to get up so early on the next day. So we go back to our hotel early. Address : 17000, Hospital St, Krong Siem Reap, Cambodia. Hotel : Neth Socheata Hotel. Here comes the hotel. A lot of DM me on Instagram asking where do I stay. Well, I will suggest any hotel located in Pub Street because the location is convenient. We had chosen Neth Socheata Hotel which is surrounded by many restaurants. It might be hard to find because it wasn't facing the main street though. Address : (Pub street area)# 284, 2Thnou Street, directly opposite the Old Market, Siem Reap City, Siem Reap Province, Cambodia. Follow Tour or Travel On Your Own? Most of you asked me this question. Is it safe to travel alone as a female? Is it safe to travel on your own or backpacking? Or should we just book a tour or so on. Well, let me explain to you guys one time here. What we had done was we already arranged our own itinerary before we travel there. Then, my friend found the driver and send him the itinerary so he can quote us the rate. So don't ask me how much we pay the driver because he quotes us according to our itinerary. Different itinerary different quotation. I would not suggest travelling alone if you're a female due to the safety issue. Some of the places require tour guide as we are interested to know the history of the place. Therefore, the driver will find a tour guide for us. Of course, extra charge. It always depends on you how you want to travel because I saw some of the couple travel on their own and without a tour guide. Driver's contact details are provided as follows.